This tutorial is a variation on the month to month percent change tutorial. This specific exploration in year over year performance was born out of reviewing my google analytics information. The specific analysis question I am trying to answer is, how did this current month of website visitors compare to the same month last year. For example I want to compare the number of visitors for November 2016 to November 2015. Did I have more users this year in this month or last year? What was my percent changed between the two months? let’s begin with loading our data and data transformations. Open up PowerBI Desktop, Click the Get Data button on the Home ribbon and select Blank Query. Click Connect to open the Query Editor. Click Advanced Editor on the View ribbon. While in the Advanced Editor paste the following code into the editor window, click Done to complete the data load. Note: If you need some more help loading the data follow this tutorial about loading data using the Advanced Query Editor. This tutorial teaches you how to copy and paste M code into the Advanced Editor. While still in the Query Editor rename the query to Data. Then click Close & Apply to complete the data load into the data model. Enter in the following equation to calculate the last year monthly sales amount. Note: Using the NOW() function calls the current time when the query was last run. 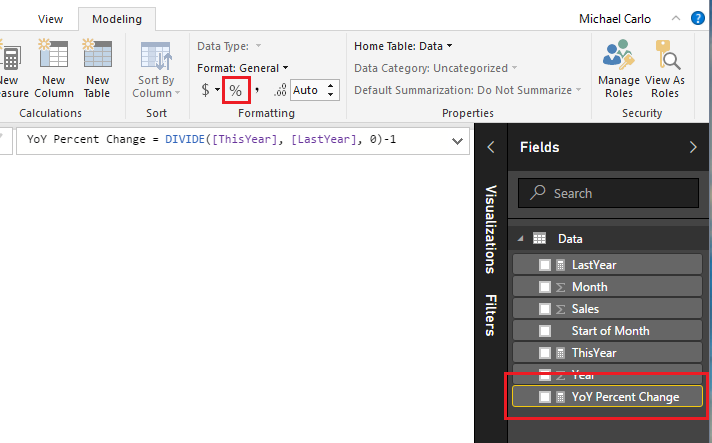 Thus, if you refresh your data next month the NOW() function wrapped in a YEAR() will return the current year from the date-time observed by PowerBI. Following the same process enter the following additional measures. The ThisYear measure calculates the sales for the current month. Finally, add the calculation for the Year to Year comparison. Since the YoY Percent Change is a real percentage we need to change the formatting to a percent. Click on the YoY Percent Change measure then on the Modeling ribbon click the % symbol in the formatting section of the ribbon. Next, add a Stacked Column Chart with the following columns selected. OK, we have a chart, but it is kinda awkward looking right now. The x-axis is the month number but we don’t have a month 0. That simply does not make sense. Let’s change some of the chart properties. While having the Stacked Column Chart selected click on the Paint Roller in the Visualizations pane. First, click on the X-Axis and change the Type to Categorical. Then click on the Data Colors and turn on Diverging. 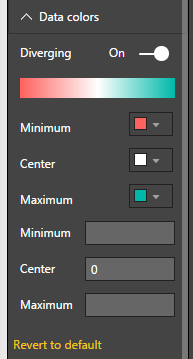 Change the Minimum color to Red and the Maximum color to Green. Set the Center to a value of 0. Click on the Title change it something meaningful, Center the text and increase the font size. Our bar chart looks much better. However, the month numbers do not look quite right. Visually the month indicators would be cleaner if we didn’t have any decimals. Click on the Month field and then on the Modeling ribbon change the Data Type to Whole Number. There will be a warning letting you know that you are changing the Data Type of the Whole number. Click OK to proceed with the change. Another successful percent change tutorial completed. I hope you enjoyed this year over year month comparison example. Make sure you share if you like what you see. I’m totally new to power BI. I’ve created small spreadsheet and connect it to power BI. In the spreadsheet, it has few columns, i.e Item A, B, and C, and the number of item of these items are updated everyday. 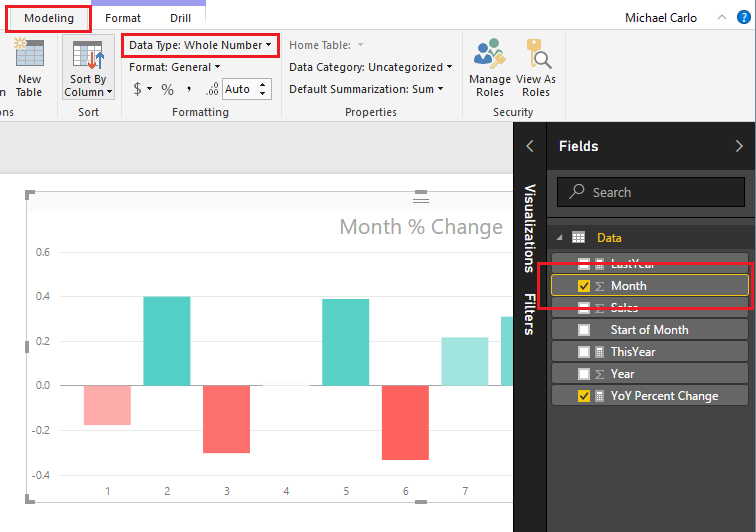 It seems that when someone making change to number of item in the sheet data source, the power BI would only display the last data available. How can i keep power bi to keep the previous data, so that it displays in a incremental form ? Tony, great question. 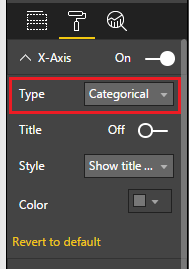 PowerBI will only be able to display what is currently listed in the file. Thus, if you have items A, B, C, from yesterday and now today that data has been modified to only have A, & B. Then Power Bi upon refresh will only show A & B items. In order to capture historical data you would need to have multiple files with the same format but with different names, such as 2016-12-15 Data, and 2016-12-16 Data. Then using power BI compile all the differently daily files into one data model. For compiling multiple excel files into one data model you can follow along with this tutorial. In summary, to capture all your historical data you will need a process in your excel file or files that allows you to keep all that data instead of changing the data. Hope that helps, thanks for the question. I think this is fairly easy to implement. To do this you could add another column that has the week number of the year. To add this column you would have to open up the query editor click on the Add Column ribbon and then click the Date button. Select Week then select Week of Year. This will provide a column that increments the week of the year from January 1 (week 1) through December (Week 52). Your new column should be automatically labeled WeekOfYear. Close the Query Editor and then change your two measures to use the new column WeekOfYear instead of the Year column. This should now allow you to calculate year over year week percent changes. Great post, thank you! How can I modify this to handle months that have no values? In Excel, it would return #DIV/0! and in PowerBI, it calculates to -100% or ‘Infinity’. Can you suggest a way for it to return “NA” is something similar? It helped me a lot for the reports i’m making. Can you assist me in creating a measure which returns total sales for current week and or month? I tried using your example and replaced Year with Month but it doesn’t work. It says: DAX comparison operations do not support comparing values of type Text with values of type Integer. 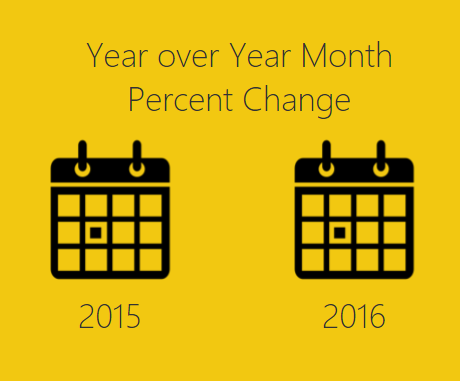 Given the fact that im new to PowerBI i couldn’t wrap my head around it to transform my Date(month) to integer. a Week to date is more complex. Note: this can be automatically generated by clicking the Add Column ribbon in the Query Editor, highlight the Date column (make sure this data type is a date), Clicking the Date drop down, and selecting Week, then Week of Year. Close and apply to load the data from the query editor. Then you can make a table visual where you include the sales column and the week of the year column. Set the week of the year column to not summarize, and set the Sales to sum, and you will have the total number of sales by week. Calculation error in measure Deal[This Year Sales]: DAX comparison operations do not support comparing values of type Text with values of type Integer. How am I gonna do to fix this? This is a simple fix. You will need to make sure that all your calculations using the SUM are of a specific data type. The data type should be an integer or number. To fix this click on all the column that is being summed which should be sales. Click on the Modeling ribbon, and then change the Data Type: to either Whole Number or Decimal Number. That should force the column to be the correct data type for the sum calculation to work. can we do this in the cloud version? I’ve downloaded the Google Analytics Content pack and would like to add YoY comparisons from here. Is that possible? Thanks. Hi, you can apply the same principles with your google data. I would recommend that you check out the quick measures now included in the latest version of Power BI. Hit the link below to read more about Quick measures. look at the time intelligence measures for Year over year change. However, your example shows Calendar YoY. What would be possible solution when you need to show YoY for fiscal year that involves two calendar years, like when FY starts in June 2015 and ends May 2016. Could you please advise on this scenario? This would require making a custom column that would track that information for you. Power BI does not have a concept for allowing you to shift the fiscal year. Thus, this usually becomes a slight pain. I have yet to find a good example of shifting the calendar year to start with a company fiscal year. These tutorials are absolutely fantastic. But I wonder why in this case you are not using SAMEPERIODLASTYEAR function? good question. It’s on my to do list. Is there a way to create this? The ‘line and stacked column chart’ and the ‘line and clustered column chart’ options do not display the data properly. Also, is there a way to show labels on the % Chg only? I don’t believe there is a visual at this time that allows such flexibility with your y-Axis. When you use the line and bar chart, the line has an axis and the bar will have a secondary axis. I don’t believe you are able to have two secondary axis’ for bars on the same chart. 1. Use the Bar and Line chart. 2. This year sales & Last year sales as lines. 3. Use the bars as percent change. When I presented this chart to business leaders they liked the style and intuitive nature of the chart. Best of luck, Mike. Is there a way to get the month name rather than just an awkward number to show, and have the months sort correctly (e.g. in chronological order rather than alphabetical)? You can do this by creating a reference table with the month numbers and names. When you use this table you will need to set up the sort order. To do this you will need to create the table, with ids [1 to 12] then the corresponding month name [Jan to Dec]. Then load the table to the data model. Next highlight the column with the month names, then click on the modeling ribbon, then select Sort by Column, and choose the id column that you made earlier. This will properly arrange the month names by their calendar year order. 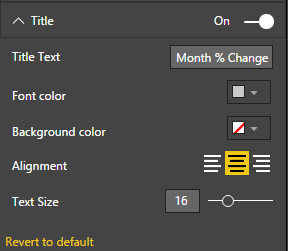 Then when you are making your visuals, use the Month name instead of the number of the month. Be sure to create a relationship between the month number from your master date table to the month by name table. Great article. I am new to Power BI and coming from Tableau. One report/dashboard that I did in Tableau for my company was to compare services this year, month, and week with last year, month, and week. Another words, report has Year, Month, and Week filters and when staff chose let’s say 2018, Feb, Week 1 the report populate data and graphs (HeatMap) of 2018 Feb Week 1 with 2017 Feb Week 1. My question is how can I calculate last year month and week services in Power BI? I used Sameperiodlastyear but that only gave me this year as compared to last year and no more. Any suggestions? Thank you Mike. The codes for generating the calendar and other calculations were very helpful. How to calculate YOY growth change,for current Quarter, Month, if in the previous Year Quarter, and Previous Year Month data is only partially available.In other words, how to select current range based on what is available in previous range (previous year) ? You might want to try using the quick measures. Right click on the table where you want to add the measure. Then select New Quick Measure. A menu will appear. In the drop down menu, there will be a Time Intelligence section. Try some of these calculations Year over Year, Month over Month, to see if this is able to calculate what you are looking for. Great Article, how can we show the percentage change of 3 years say from 2015 to 2018 (instead of comparing this year and last year)in a single chart.